Stroud’s contemporary art event, the Site Festival offers a full and dynamic programme of visual arts, performance, music, screenings, open studios, artist talks and workshops from Wednesday 1 May to Saturday 1 June 2013. INDEX will open the festival from Saturday 4 to Sunday 12 May 2013 with a newly commissioned installation by Siobhán Hapsaka, The Sky has to Turn Black Before You Can See the Stars, created especially for the Goods Shed in Stroud and featuring an astonishing diversity of materials and elements, which organisers say address the themes of dislocation and loss, hope and desolation, conflict and resolution. 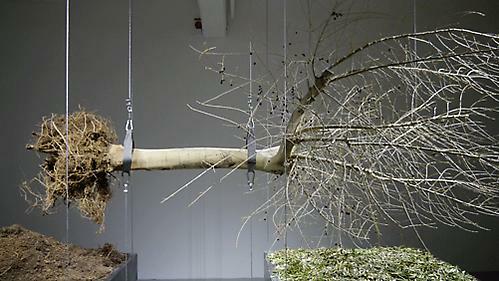 Vibrating uprooted olive trees are the central presence in Siobhán Hapaska's newly commissioned installation. This powerful, evocative piece extends her interest in the co existence of extreme opposites, exploring themes of conflict and resolution, both domestic and political, which challenge our belief systems and our sense of the natural order of things. Juxtaposing the natural and synthetic, Hapaska's meticulously crafted work presents a world on the edge of the abyss, but also on the edge of possibility.